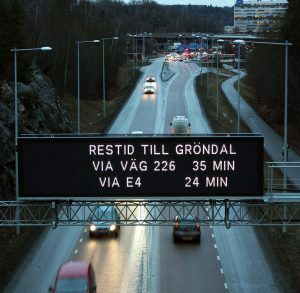 Sweden’s capital is alleviating congestion and giving road users more accurate, live traffic information. It all comes down to real-time and historical travel and flow data gathered directly from road users Bluetooth and Wi-Fi devices. In Stockholm, the most populous city in Scandinavia, the number of cars on the roads is constantly increasing, leading to higher congestion, reduced road accessibility, and increased environmental pollution. In Stockholm County alone, there are over 400 passenger cars per 1,000 inhabitants, a number compounded by occupational vehicles and public transport that also contribute to congested road networks. To increase travel time transparency, reduce environmental impact and optimise traffic flow, the city realised they needed to have a bird’s-eye view of the traffic network, as well as detailed, up-close analysis of ongoing issues. They also needed a way to act quickly when things start to bottleneck. After reviewing several systems, Traffic Stockholm found that the best solution for the job was the Veovo queue and travel time measurement solution.  The solution is primarily based on the movement of Bluetooth and Wi-Fi-enabled devices in cars. It provides the city with both real-time and historic traffic information, including detailed statistical information on the travel times, average speeds, dwell times, and movement patterns. Crowd-sourcing and probe-data services from large, well-known international traffic data providers were unable to provide individual vehicle data over specific distances. Additionally, their licensing restrictions limited data retention and the applications that their data could be used for. A lack of transparency and auditability of those data sources rendered them unsuitable for this specific work. The analysed data is also used to display live traffic information on signs around the city. The travel times are continuously updated, in line with the actual behaviour of road users, so, by considering their route and the time they depart, motorists themselves are helping to reduce bottlenecks and keep traffic moving. Besides the benefits of real-time reporting, the empirical data is used to detect driving time anomalies. Effectively, this means that the solution can pinpoint road sections and intersections where driving times deviate from the norm as a result of construction projects, incidents, roadwork, faulty traffic lights and other factors. With this information at hand, real-time traffic management can take place. The data provides a thorough comparison of current vs typical driving times, minute-by-minute throughout the day. The typical driving times, which are continuously updated, are based on various type of days (weekdays, weekend, vacation season or not) and time of day. If driving times deviate from the typical driving time, the system automatically raises a flag. As the system logs and visualises all deviations, traffic engineers can create historical performance and reliability reports based on deviations from the norm. Managers are provided with an overview of the current situation and tendencies over time, to allow for road improvements and development where needed. 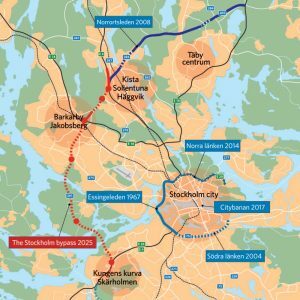 Stockholm joins a host of other major cities, including Bangkok in Thailand, Zurich in Switzerland, Aarhus and Copenhagen in Denmark, Portsmouth and Port of Dover in the UK and most of New Zealand, which use the solution to measure and optimise how road users travel and use the city´s roads.